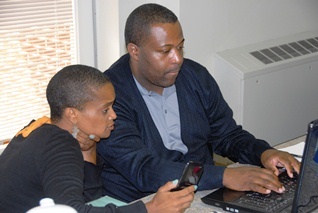 ExpressJet Flight Attendants Nicole Washington-Fears and Robert Sayles prepare for an upcoming election to determine representation rights at carrier formed by merger of Atlantic Southeast Airlines and ExpressJet Airlines. IAM-represented Flight Attendants from ExpressJet Airlines Locals in Newark, Houston, Cleveland and Chicago convened last week at the IAM’s Education Center in Southern Maryland. The Flight Attendants worked with Grand Lodge legal, financial and communications staff members to develop a program to preserve their IAM representation and extend representation rights to Atlantic Southeast Airlines (ASA) Flight Attendants. ASA Flight Attendants are currently represented by another union. “We are proud to be Machinists, and we are prepared to fight to remain in this union,” said Sara Gonzales, Newark-based IAM-ExpressJet Grievance Representative. ExpressJet and ASA completed their corporate merger earlier this year, and a union representation election is necessary to determine which union will represent the combined airline’s 2,200 Flight Attendants. Topics discussed included communications, comparing contracts and a review of National Mediation Board (NMB) organizing rules. The group also developed an action plan that is being deployed across the ExpressJet and ASA systems. Flight Attendants are awaiting a single carrier ruling from the NMB, which is the first step in a process that will result in a representation election.